Distance won over: 7f. to 12f. A 6-time Group One winner bred on a similar Danehill/Sharpen Up cross to exceptional sire Danehill Dancer. 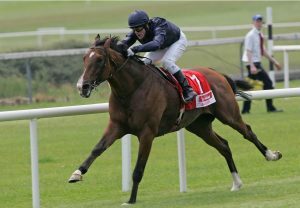 Probably the best horse ever by sire of sires Danehill. And he's a half-brother to Classic winner Homecoming Queen & European Champion 2yo filly Queen's Logic. A proven Gr.1 sire, Dylan Thomas' top flat performers include Gr.1 winners Pether's Moon, Nymphea, Tannery, Blazing Speed, Dylan Mouth, Nightflower & Final Score, Gr.2 winners Porsenna, Not Listenin'tome & Dylan's Promise, Gr.3 winners Captain Cat, Furner's Green, Dylanson, Premiere & Tom Melbourne, Listed winners Vally Jem, Glowing Cloud, Chutney Flight, Goldoni, Sweet Thomas, Spark Plug etc. His first National Hunt-bred crop are now 4yo's! Already sire of G1 steeplechase winner Swansea Mile & blacktype performers/winners over hurdles/fences for: Dan Skelton, Donald McCain, Tim Easterby, Philip Hobbs, Willie Mullins, Gordon Elliott, Francois Nesa etc.